Hold the phone: the Namely mobile app is now available on Android. The release follows the successful launch of our iOS app last year and is just another important step in our goal of building a better workplace for everyone, every day. You aren’t tied to a desk, and neither is your work. 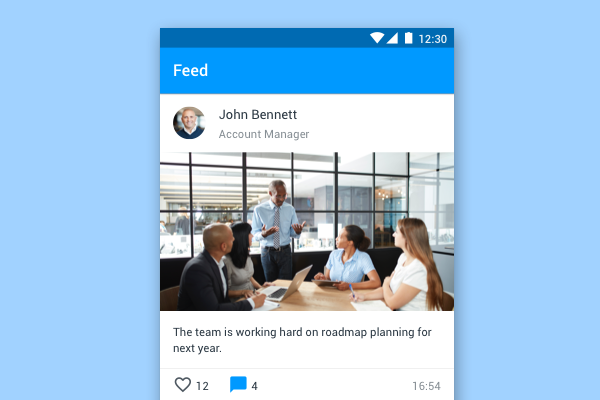 By using the Namely mobile app, employees can request or manage their time off, post updates to their company feed, and share photos—all on the go. Users also have access to a full company directory with co-worker profiles and office locations. The Namely app keeps your people connected wherever they are, on whatever device. Your employees can visit Google Play to check it out and download. Why mobile? Work has changed. HR technology sometimes gets a bad rap as clunky and antiquated. When we started Namely five years ago, we set out to make something different: a platform that was social and engaging, delightful for employees and HR managers alike. To successfully do that today, you have to go mobile. Our desktop users spend an average of nearly ten minutes on Namely per day, stats on par with both LinkedIn and Twitter. That’s time spent reading company updates, drafting personal goals, requesting time off, appreciating colleagues—tasks ranging from routine to strategic. But the workplace has gone mobile. We text coworkers and check work email from the comfort of our smartphones. A survey last year revealed that 76% of all employees would use a mobile app to access a company’s HR tools (millennials were 20% more likely). To serve that need, HR needs to break free from the confines of the office desk. Our personal and working lives have gone mobile, and so has Namely.